I’m almost at the end of Whispers at Moonrise and Kylie finds herself wondering if we really have soul mates in this life? Is there one person you were meant to find and spend your life with in this world? Or are we capable of connecting with several someones that we find during our lives. Yes, she’s trying to decide if Lucas or if Derek is her soul mate. As a writer and reader, the premise of soul mates is found in so many literary works. There’s something romantic in the idea of being on a journey in which our main goal is to find that one perfect person. Ahh, is that really real? I have to tell you that I’m not completely sure I believe it, I’m not completely sure I don’t believe. When I look at all the little things that had to happen for my husband and I to find each other in the world, it’s makes me wonder if Fate didn’t have a hand in it. You see, he was from Texas, I was from Alabama. When bad economical times hit in Texas, he applied for jobs all over the US. He had offers in several different states. The one he took was in California. When he moved there, of all the apartments he could have chosen to rent, he picked one in the complex where my mom lived. Because she had a southern accent, similar to his Texas drawl, he met her one day out by the pool. And when I found myself needing to start my life over, I moved to California. So many things had to have been lined up for us to meet. Is that not Fate? But the thing about soul mates, and finding them, is that sometimes it seems our hearts tell us this one person is it, and then later down the road in life, it seems to be evident that they weren’t the person. Both my hubby and I had thought we’d found the right person before we found each other. To be honest, as a teen, I thought numerous guys were my soul mates. Maybe they weren’t so much my soul mates, maybe they were simply stepping stones, learning tools, to help me grow into the person I am, and the person I needed to be when I did meet my hubby. Yup, the idea of soul mates really does intrigue me–almost as much as it intrigues Kylie. So what about you, do you believe in soul mates? The winner of last week’s Shadow Falls t-shirt and other goodies is Sandi Bothum with “Whatta ya mean, tastes like chicken??! !” Congratulations, Sandy! You have a week to send your snail mail address to me at cc(at)cchunterbooks(dot)com. In Taken at Dusk, Kylie learns that she has Native American blood. While I’m told I, too, have Native American blood in me (my great, great grandmothers on both my mother and father’s side), this isn’t where this idea stemmed. It came from a legend and a park I visited numerous times as a child. And amazingly, this legend also involves a falls. The story associated with the park is a sad tale of lost love, but I guess even as child I was a romantic at heart. So I rewrote the ending to that legend and I have to tell you, I like my version better. Hey…I like happy endings. This last weekend, I went to my hometown and visited the park again. Each time I go there, I feel something akin to magic. Maybe like in my book, the falls are magical. Now the falls are amazing, but even before one spots the rush of water cascading 90 feet into the breathtaking ravine, they see the 13-foot-tall bronze statue, caught mid-stride on a rock overlooking the falls. Erected in 1958, the statue with the inscribed story of Noccalula—a young girl who was determined to follow her heart. Once named Black Creek Falls, legend has it that there was a beautiful Cherokee maiden deeply in love with a warrior of her own tribe. Her father, a great chief, ordered her to marry a Creek chief. The wedding day came and she allowed herself to be arrayed in festive wedding robes. But heartbroken, she quietly slipped away to the falls. For a moment she stood poised on the edge, and then with one leap, her life was over. Grief stricken, her father gave the great cataract his daughter’s name, and since that day, the falls have been called Noccalula. See, that’s just too sad. But in my version, her warrior was there waiting beneath the falls and he pulled her out, right before she was yanked into the dark murky undercurrent. Believed dead, she was free to leave. So her and the young warrior, who was quite good looking in my version, left together and found happiness. Don’t you like my ending better? Today, they also have a small zoo there. So, I snapped a few pictures of some animals. And one of the images just screams for a caption. Today, I will give away a Shadow Falls T-shirt and some promotional items, like pens and pads, to one person who gives me the best photo caption for the photo at the left. The winner for last weeks giveaway is Missy. Congratulations! 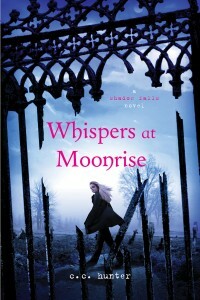 So, Missy, please email me within one week at cc(at)cchunterbooks(dot)com with your snail mail address. 1) I don’t like bullies. People like Fredericka infuriate me. Making people feel badly about themselves just so you can feel good about yourself is just so darn wrong!!! I really try to accept people for what and who they are. Just because someone is different doesn’t mean they are bad. 2) I’m a romantic at heart. Duh, you should really have figured that one out. I love romance. I love the thought of two people falling into that special emotional place where everything outside of the world disappears until all you can think about is that person. How he makes you feel; how his soft touch makes you glow on the inside. And how his kisses taste. 3) I follow the theory that laughter is the best medicine. Have you noticed that Kylie and all her friend regularly get together and find tons of things to laugh about? I mean, how can a person not understand that laughter is key to getting though life’s crappy stuff. Seriously, bad stuff is going to happen sometimes, and the best way to survive is to tap into the wonderful healing power of laughter. 4) I believe in magic, fate and Karma. Some people call it woo-woo. I just believe things happen for a reason. I believe the tiny choices we make in our lives guides us down a path and define our future. I believe when you give to the universe, you get back. If you are short on time, give some time away. If you are short on love, give some of that away. If you are short on money, give some of that away. It has worked so often for me, and I encourage you to try it. 5) I believe our mistakes are learning tools. Look, everyone makes mistakes. We say the wrong thing, we let our mood effect how we treat people, and sometimes, we trust the wrong people. I’ve always said,” It’s okay to make mistakes if you learn from them. “ I believe in practicing forgiveness when it comes to mistakes, not only for other people, but for yourself. However, there is a difference between a mistake and character flaw. A mistake happens because someone wasn’t thinking clearly, a character flaw happens because a person doesn’t have the moral character to act and react in a good way. Okay, so there you have it. Five things you should have guessed by reading my books. So tell me, is it true that a reader’s personality can be detected from the type of books they love to read? What do you think? What do your reading tastes tell about you? Or is not the same thing? Since last week’s giveaway was so much fun, I’m doing it again! I’m giving away another ARC of Taken at Dusk and a Shadow Falls t-shirt. All you have to do is leave a comment for a chance to win. I will announce the winner next week, so be sure to check back then. We have a winner from last week. The lucky reader is Christina M. So, Christina, you have a week to email me your snail mail address to cc(at)cchunterbooks(.)com. Congratulations! I love amusement parks, and so does Kylie. In fact, she is still dreaming of the day when she and Lucas can go to an amusement park together. You see, because Lucas was brought up as a supernatural (and werewolves are pretty much as supernatural as you can get! ), he didn’t have a normal upbringing. He never did the normal things that human teens did like spend the day at an amusement park. Kylie was fortunate enough to be able to do all those normal growing up activities, and now she wants to share some of those fun things with Lucas. Because, when you care about someone, you naturally want to share everything with them—especially things you love. As a kid, every summer I would go to Six Flags Over Georgia. Or we’d take off to Florida and do Disney World, or go to one of the theme parks in Tennessee. I can still remember the cotton candy, the hot dogs and the rides. Now, I can’t even remember which park it was– I’m sure I blocked it out of my mind–but the ride was an old fashioned wooden rollercoaster. Let me tell you, it scared the beegeezus out of me. It creaked and moaned and sounded like it would break apart throughout the entire ride—the longest 2 minutes and 15 seconds of my life! Now you might be wondering what got me thinking about amusement parks, well, I’m going to one this week. Well, it’s not really an amusement park, it’s a virtual amusement park. Barbara Vey, a friend of mine, is having a week long party celebrating her fifth year as a blogger for Publishers Weekly’s Beyond Her Books. And on March 8th, she is having a very special young adult author’s party, and the theme for the day is amusement parks. It’s sort of like a live chat, everyone makes posts and leaves comments, and when the week is over, Barbara gives away lots and lots of prizes. Last year, Barbara had tons of giveaways from many young adult authors, and this year looks to be even bigger! I’m going to be giving away a copy of Born at Midnight, a Shadow Falls t-shirt and other cool stuff. However, St. Martins is also giving away some other Shadow Falls books. 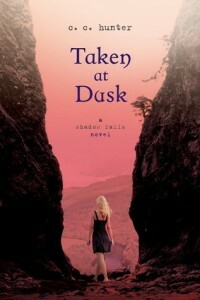 Even a few copies of Taken at Dusk. So you have to come by and celebrate with your favorite authors and you could win some great prizes. I’ve already decided that I’m bringing cotton candy to the party. Oh, and if there’s any wooden roller coasters, I’m telling you right now, I’m going to chicken out. So, I hope to see you at the party. And since we’re on the subject…how do you guys feel about roller coasters? Do you have a favorite theme park? A great memory from a day spent riding roller coasters and Ferris wheels? What is your favorite ride? Oh, to one lucky poster, I’m going to send a Shadow Falls T-shirt and an ARC of Taken at Dusk. So make sure you leave a comment.